Alright my bottle chums, its time to pay tribute to another great western bitters thats always over looked. The Yerba Buena Bitters. 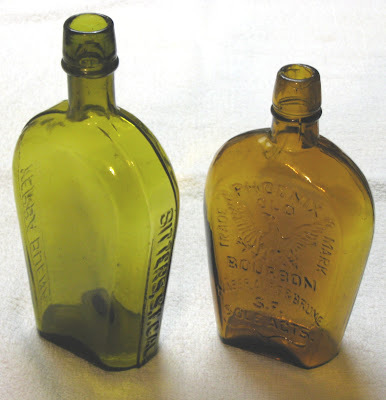 The longest produced western bitters known, from 1870-1920. The early ones have the famous curved R's and come in some wi ld colors. Homer Williams and Alfred Wright established a veterinary and medicine business in San Francisco in 1869. They purchased the formula for a new product they thought would be a great seller. The formula was purchased from a S.F. doctor and it wasn't long before the two began producing their own "Good Herb" or Yerba Buena Bitters. In 1880, after 10 years or so, The Paul O. Burn Wine Company of San Jose purchased the rights to the now famous Yerba Buena Bitters. They continued to sell it quite successfully for the next 27 years, until prohibition finally forced them to stop making it. Great color on the Yerba ! Is this "Kid" one and the same California Kid of MMA fame out of Sac Town? ?